NASHVILLE, TN — Transit For Nashville, a 45-member coalition of community members advocating for Mayor Barry’s mass transit referendum, have officially launched their petition campaign. Walter Searcy, spokesperson for Transit For Nashville, said that the main goal of the coalition is to get the community to vote “yes” on the referendum that will designate a portion of the state’s sales tax to fund mass transit system in the region that would provide light rail and an improved infrastructure and bus system. Clifton Harris, president and CEO of Urban League of Middle Tennessee, said that improving sidewalks and having a quality infrastructure system is crucial in enabling people to get from their homes to the transportation system. 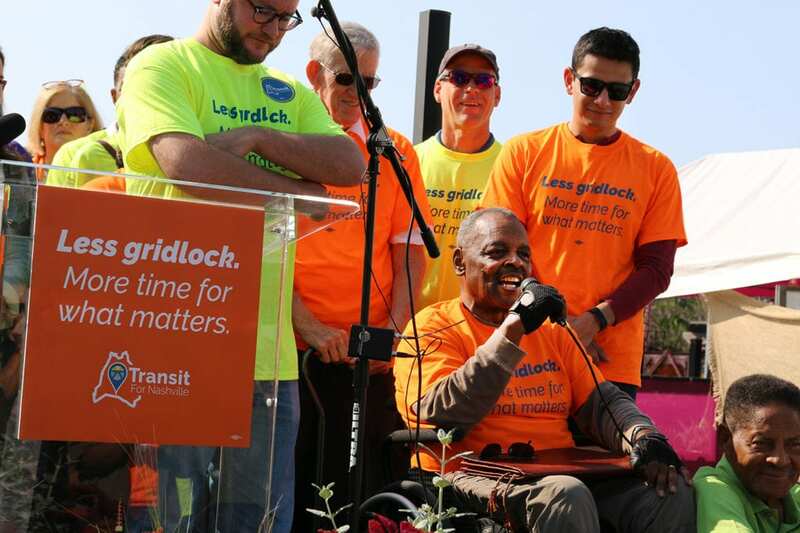 “Transit gives access to workforce opportunities and we have too many people who don’t have access to jobs because of lack of transportation,” Harris said. He also noted its impact on youth, based on a speech from a high school student and Oasis Center member whosaid improved transportation positively impacts young people. “It gives them another level of independence and another level of maturity,” Harris said, adding it cuts down on families’ budgets. A sector of the population that will be directly impacted are labor workers, with Ethan Link, program director for the Southeast Laborers’ District Council and co-chair of Transit For Nashville, saying that a lot of their members work at Vanderbilt University in dining, custodial and environmental services and use the bus to get to work. Shelly Courington of AARP Tennessee said updated transportation allows residents 50 and older to be “full members of the community.” “If they’re able to do that and have access, then they can stay in their homes as long they want to, and so we can reduce future institutions that we’re looking at because people are active and engaged,” she said. The referendum goes before a vote in May.